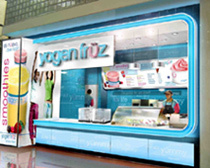 Yogen Fruz franchise business opportunity. Free Yogen Fruz business franchise information. There are a few things more personally rewarding than following your dream. As the Yogen Früz entrepreneurs have pursued their dreams, they've helped others pursue their personal dreams of owning their own business. Being in business alone can be frightening, but a Yogen Früz franchise allows you to be in a business for yourself, but not by yourself. Our experienced team of support personnel can assist you to make the most of your time and effort. You can also take advantage of the experience and wisdom of the other members of our franchise system - our Franchisees, Masters and Non-Traditional and Co-Branding partners. The success of a company is most often measured by its financial results, its expansion, its growth, its potential and by the recognition by its peers in the business community. Yogen Früz has been extremely fortunate in receiving recognition by a number of outstanding organizations in the past year. Being ranked #1 in the Franchise 500, compiled by the authoritative source of information on the franchise industry, Entrepreneur magazine. The magazine's ranking is based on a formula, including financial strength and stability, growth rate and size of the system. 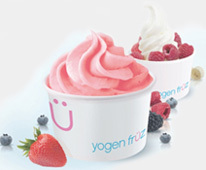 Yogen Früz was also named the Fastest Growing Franchise in the Frozen Yogurt Category. In 1986, two young brothers opened a retail outlet at the Promenade Mall in <?xml:namespace prefix = st1 ns = "urn:schemas-microsoft-com:office:smarttags" />Toronto, Canada. It was a modest effort: a small store with a great design and a strong concept that impressed one of Canada's largest mall operators who wisely decided to take a chance on a new tenant with no track record. A concept was developed that consumers immediately loved, and a strong following pursued. That something new was Yogen Früz. The name Yogen implies yogurt, of course, and Früz calls forth “frozen”, “fruit” and “fresh”, all of which play a part in the Yogen Früz concept. Today Yogen Früz has grown to be a world leader in the frozen dessert category, with over 1100 locations operating in over 20 countries around the world. On average, three new outlets open each week, somewhere around the world – a pace destined to increase dramatically in the years ahead. Yogen Früz is positioned as a healthy and nutritional product, capturing a broad segment of today’s health conscious consumer, with over 81% consumer brand awareness across Canada. To learn more about the Yogen Fruz franchise opportunity, simply complete the form below.